Butterflies are beautiful beings that change a lot throughout their lives. The monarch butterfly flies from Canada, passes through the United States, and sometimes even flies through the mountaintop forest in central Mexico. This journey is up to 2,000 miles long. Monarch butterflies go through several different stages of development. The cycle of life of the monarch begins as an egg. Next, it turns into a caterpillar. Then, it becomes a chrysalis, before it finally becomes a beautiful butterfly. A chrysalis is the form that the caterpillar takes before turning into a butterfly. The chrysalis also serves as protection. When the butterfly’s wings hatch, they look small and weak. But, when they exercise, their orange and black wings begin to grow. 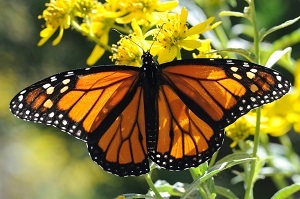 The monarch butterflies have a different diet than many creatures; they drink nectar from flowers. This is much different from the milkweed that they ate when young. Monarch butterflies lives, though short, are very interesting.